Be surprised by the hotel’s very own version of authentic Chinese cuisine filled with an array of mouth-watering dishes to savour. Feast on various not to be missed dishes at Makan Kitchen from Salmon, Tuna, “GuaiFei” Abalone, Tako with condiments at the sashimi station; Spicy tom yam soup, Chicken Soup and Chinese herb soup at the noodle station, to even RendangAyamMinang at the Malay section and the ever quintessential dish - the Yee Sang platter that will be tossed to usher in a new year filled with prosperity, good health, good wealth and more. 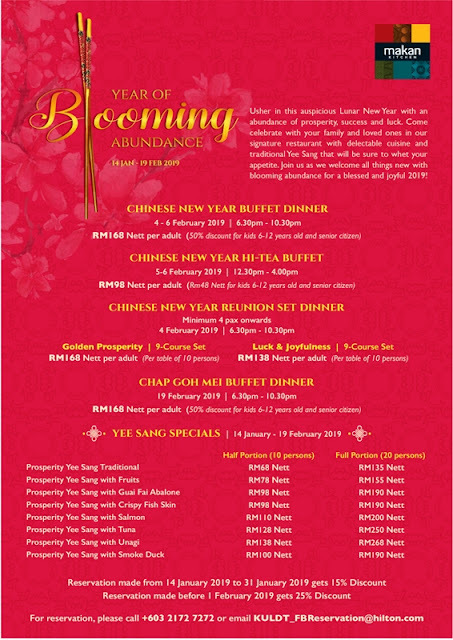 Come and join DoubleTree by Hilton Kuala Lumpur in celebrating the beginning of a New Year, blooming in abundance of prosperity, success and luck. To make a reservation or to find out more information on this Chinese New Year Promotion, call +603 2172 7272 or visit www.flavoursbydoubletreekl.com.